uuid : 534521da-45d4-4c6f-92ab-a6443d2c78bb templates_id: 119551 templates_uuid: "0a0a2803-55e3-4cca-891f-ef4968671136" title: "Letter of Confidentiality - Create a Simple Confidentiality Letter" display_name: "Letter of confidentiality" meta_keywords: "Confidentiality agreement letter" description: "
Protect yourself and your business when sharing confidential information with another business or individual. Use this confidentiality letter template to impose restrictions on how your confidential information is used and shared. This basic letter of confidentiality contains everything needed when you need to quickly agree to an NDA and import the value of your confidential information on the other party. 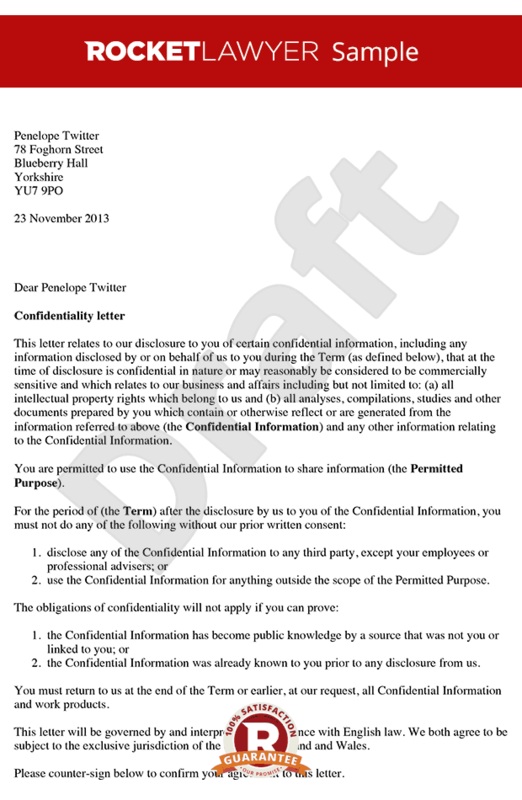 What\'s a letter of confidentiality? A letter of confidentiality is a basic and straightforward letter that acts as a non-disclosure agreement. The party disclosing confidential information imposes restrictions as to the use of this confidential information to the party receiving it. Why do I need a letter of confidentiality? When disclosing confidential information to a business or an individual, it\'s vital to protect your business by using either a letter of confidentiality or a confidentiality agreement. \r\nHaving a letter of confidentiality signed by the party receiving the confidential information ensures the information you share will be protected and not disclosed. What\'s the difference with a confidentiality agreement? This letter of confidentiality is a short and simple agreement, and as such does not incorporate the full range of provisions that are generally included in a longer form confidentiality agreement. How does a letter of confidentiality protect confidential information? The letter of confidentiality prevents the party receiving confidential information from disclosing it and using it for anything outside the scope of the permitted purpose. Are there any exceptions to the restrictions imposed by the letter? The confidential information was already known to the receiving party prior to its disclosure. How long should the information remain confidential for? The information being shared will probably only need to remain confidential for a limited period and it is preferable to set out this period in the letter. How long depends on the sort of information being shared and why it\'s being shared. 6 months, 1 year or 2 years are reasonable periods of time. This letter of confidentiality is governed by the law of England and Wales. \r\n" created_timestamp: "2018-10-08 04:36:53.0" modified_timestamp: "2018-10-08 04:36:53.0" active: true created_by: 104 modified_by: 104 dcm_id: 264 url_slug: "Letter-of-confidentiality" meta_description: "Create a confidentiality letter with simple step-by-step guidance from Rocket Lawyer. Protect and impress the value of your confidential information using our straightforward letter of confidentiality. Try this sample non-disclosure letter for free." time_to_complete: "10 minutes" role1: "Sender " role2: "Recipient "
What's a letter of confidentiality? When disclosing confidential information to a business or an individual, it's vital to protect your business by using either a letter of confidentiality or a confidentiality agreement. Having a letter of confidentiality signed by the party receiving the confidential information ensures the information you share will be protected and not disclosed. What's the difference with a confidentiality agreement? The information being shared will probably only need to remain confidential for a limited period and it is preferable to set out this period in the letter. How long depends on the sort of information being shared and why it's being shared. 6 months, 1 year or 2 years are reasonable periods of time. More than just a Letter of confidentiality template, our step-by-step interview and guidance makes it easy to create your document. Easily create online, download, print and sign your free Letter of confidentiality in minutes. This document is also sometimes called: Confidentiality agreement letter.